6 or 8 snelled hooks. Snell is a leader, of monofilament or fluorocarbon, that separates the hook from the swivel; it comes with a loop that slips onto the swivel, thereby saving any knot-tying. These hooks (6 is larger than 8 - which is larger than 10, etc.) are excellent for panfish (sunfish, bluegill, crappie ("croppy"), perch). 1/0 - 3/0 extra wide gap shank hooks. Read as "one-ought - three/ought"; this is important as 1/0 is smaller than 2/0, which is smaller than 3/0, etc. 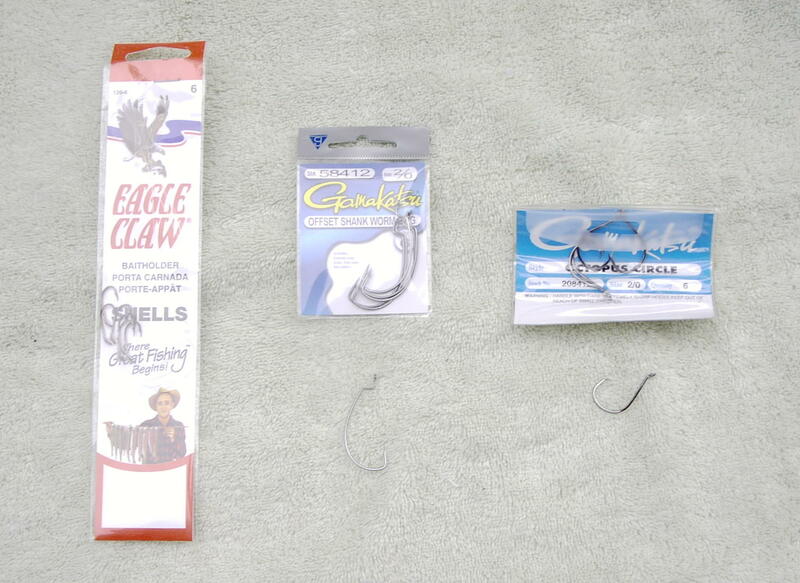 These hooks are ideal for plastic lures - and the typical Texas rig. Primarily bass hooks.